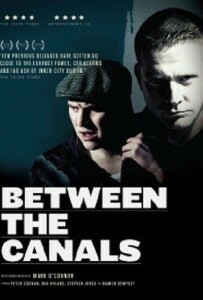 Between The Canals follows three small time criminals from Dublin’s North Inner City as they each aspire to be somebody in a fast changing society: Liam (Dan Hyland) a small time dealer who wants to quit his life of crime to become an electrician and provide for his girlfriend and son; Dots (Peter Coonan), a crazy, irresponsible thug with ambitions to become a big time dealer and Scratchcard (Stephen Jones), a drug user with no ambitions but to stay on social welfare and watch the world go by. Liam is torn between life in the flats and his responsibility to be a good father to his son. He has to just get through this one day and maybe things will look brighter on the other side. But it’s Saint Patrick’s Day and, in Dublin City, this means trouble everywhere. A heartbreaking and occasionally hilarious story of loyalty, duty and masculinity.